So what do you do on a wet foggy day? Well that’s one of the benefits of having a relaxed pace on a trip. We Gathered some more wood, had another cup of coffee and sat around the fire under the tarp with the hope the forecast would pan out. Dry and warm is always good. This was not the first time on my trips here since 85 that I have sat and enjoyed the fire. The tracks are not too far above us and you can hear the Canyon tour train going in and out and at this point the updated forecast was the weather was not going to break. So after the tour train went back up out of the canyon we decided to go anyhow, wet and foggy. The light conditions were more like late evening as we walked through the forest. By the time we got to the tracks the rain and slowed to a drizzle but the fog still hid the hills. A little B&W conversions puts you more in tune with the conditions we had, but still very surreal in its mystic feel. We hiked down to the hydro wires that cross the river here and the ATV/snowmobile trail to where we could view an AY location. We waited hoping we get a break in the fog. There was a downed tree that was under the forest canopy that made a great protected viewing location. You can not see the river or the hill well from the location AY painted from but the view is great! even in the fog. Link to 2016 conditions of the location. Next up was a Frank Johnston location, and the dark conditions actually help with the view for matching this painting site and the fog had lifted so the whole cliff face was visible. “Mouth of the Canyon” Frank Johnston. Sandi at the site, the image on her phone really captures the painting site. Sue and Jim said they had never been photographed together at a site of an original G7 member, so we took care of that this day. & Waterfall Algoma, Lawren Harris. It was colder and the rain was heavy again. The trees bent from winter storms obscured some of the scene, but the water level was almost exactly the same as 1918! This is Jim’s image. There was another Lawren Harris site near here we could not get to because it was just too slippery on the rocks to get there. These kind of decisions have to be made in the Canyon, you are just not close to any quick and easy exit should something happen and even harder to get anyone in there to help you. A fire under the tarp and a hot supper with wine awaited us! Dry & warm with a full belly, a comfortable place to have a rich conversation what more could we ask for. For years I have been offering gifts of tobacco to the fire to thank those who have been in the Canyon before and to give thank for safe passage. I had secretly done so the previous nights on this trip so tonight we all shared in this ritual that the First Nations have been doing in the area for thousands of years. Sandi and I made plans for the next days paddle and what we would face in the river and where we might camp next. The forecast was not great, cool and a good chance of rain again. We woke up to rain and mist but at least there was no fog. We were up and on the water by 9, with a short easy Class II and then a long Class II up to the flat water stretch above the old logging dam site. At the portage around the old logging dam, a Class III and IV rapid, the idea was to take the historic portage. The terrain is quite good with only a steep decent to the river. It is longer and I thought it would keep everyone warm on a very cool day. It has been a few years since I have hiked this and the trail quickly disappeared in a maze of dead fall. I left the others early as they emptied the canoe so I could clear anything, I ended up being deflected so much I ended at the campsite half way down the rapid which is where I would have been if I followed the trail along the rapid. Sandi when she came upon the mess stopped and waited for me to return, which was very wise and the right thing to do. I would have taken one bag out and carried it down lighten the load in the canoe anyhow, but it was not a lot of fun the way I went. So new plan I would run the one canoe solo and tandem down to the halfway point with Sandi. The first 200m is very fast with some very real places to wrap a boat with the second 200m being a very technical boulder garden that ends in a short pool above the Class IV, both runs were happily very clean and fun. Sandi & I at the bottom of the first half. The next question was can we do the readers digest version of the portage about 125m or have to do the mountain goat thing, although not long, a steep climb and descent with a few minor dead falls. But first we had to see the very fresh wolf tracks on the sandbar where we took out. We were in luck! we could do the short carry, Jim and I both slipped into a hole where the ground gave out, at the spot where we dropped the gear before going to the river and we were lucky with no twist type injuries as we dropped in. With the very wet slippery conditions the Munter hitch came in very handy again. Sandi and I would launch from the bottom of the last drop and Sue and Jim would meet us at the end of the short gorge by a flat water pool. I did not take any images of how we launch from this year but here is what it looked like a few years ago. The water was quite a bit higher this year. There is a natural ” “U-shaped trough here, with the use of a prussic loop as a break to hold the canoe, once there is some weight in the boat it is pretty secure. It is mostly just fast aerated water at this point and at the level we were at were still well downstream of the recycle into the hole. Sandi coming out of the slot. The view from the bottom of the pool looking back upstream. Right below here is an island, the river right side has a shallow entrance at the top but a nice gentle Class II and this is the side I always take. This year the river left side had a river wide sweeper that would be hard to see. There are two portage take outs for Agawa Falls, one on river right just below where the two channels merge past the island, which is where we dropped off Sue & Jim. The park portage sign that I put up here a few years ago and the tree that it was on are now gone. To get to the other portage takeout at our river levels this year is a Class III with not much of an eddy and only 100m above the falls. This is Jim’s pic of the view from the “close” takeout. We got all the equipment to the first steep descent where we would again use the Munter hitch to get it down the slope. It was still very cool and damp and dull it was here, half way through the falls portage where we pulled out the weather radio to hear the forecast for tonight and tomorrow morning. I was leaving the decision up to Sue and Jim because of the number of cold wet days we have had. It was not that much of a push to go to the lake from here so that wasn’t an issue. Even though the forecast was not pleasant they chose to camp again. Hint! the forecast ended up being totally wrong for the night so it was a great decision. The second steep descent is still blocked by dead fall so we had to stage and again slide the gear down the hill but using the ropes to do this does save a lot of energy. Now it was time for an Agawa falls visit from the bottom. With the higher water I was not sure that we’d be able to paddle over to access point till we got a good look at the outflow and whether we could paddle there safely. Lets just say it is a bit of a jet to cross to the side of the river where you can walk up to the falls. All that water coming over the falls is going through about a 4m wide gap. Sandi’s pic of Sue’s arrival. All safely back at the portage put-in, it was time to pack up and head on down. No sooner had we started then we saw Pink Salmon in the river. It was great having more water on this stretch of river. 800m downstream at the channel that was blocked by a log jam last year that you could not see, had three new trees down that we could see. The extra water enabled just a short wade and pull into the very wide old channel where we could float again. It was here where I stood up to pole/paddle to get through the shallows. There are no G7 locations that we know of painted down in this part of the canyon but there are some scenes that you paddle through that were painted from the tracks high above the river. View of the rock feature from the river and we had sun! that wasn’t in the forecast! Both the linked image from my previous trip and this one from Sue and Jim are taken from where the river disappears in the middle of the painting and the rock feature is just to the left of JEH’s landscape. Just downstream from the above image, and just to the right (east) side of that beautiful landscape is the last major rapid on the river. If you really want to get a feel for this area read “The Forest” by Stewart Edward White, chapter XII “The River” is the Agawa. It is available from Guteberg.org. This was written before they put the tracks into the canyon. His description of “Halfway pool” and the rapid at the top is right on target. A very neat point of interest is if you use the historical maps the Halfway pool really is halfway between the lake and the falls. This image does not do justice to the size of the “hole” and whirlpool that forms off of that house rock that is beside Sandi and I, but it does show how little we look in the river. 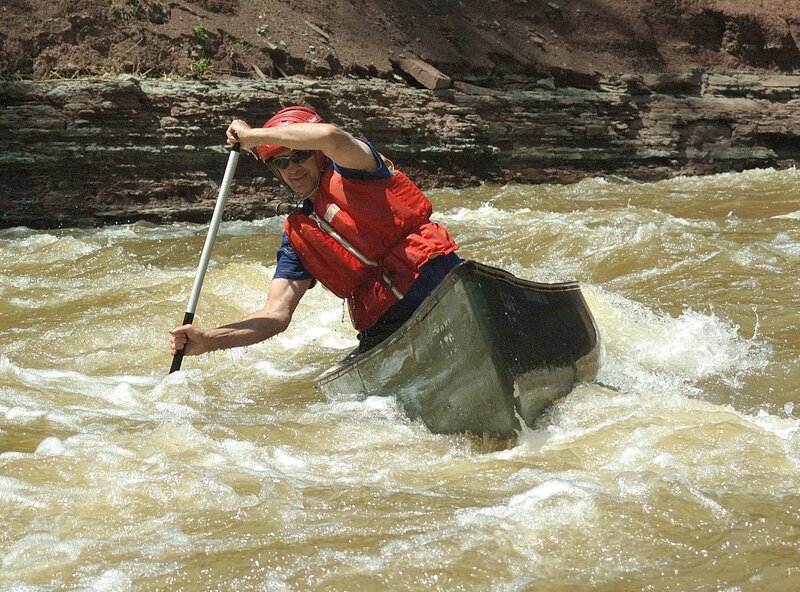 One more rapid remained, it is not that big but it is harder in low water as the river channel flows into a house rock, but at this level we were able to stay wide of any of the obstacles. Since the falls, Sandi and I had been discussing which campsite we should use for the night, it turned out we were talking about the same site, we just both remembered different things we liked about it. Me, I like the fact that even though it was on the Towab hiking trail there was always an ample supply of firewood across the river from the camp. Sandi liked it for this tree. Even though it was cool with the forecast being completely wrong for the afternoon, this is the dryest we and our gear had been since the first day! There still was some low clouds coming in off the lake and it made for some great photographic conditions and even though we could not see the sun set we had a great show. One of the disappointing points of the weather was we knew that the lunar cycle was almost the same as the first G7 Box car trips and hoping to experience some of those night skies. Even though this camp site is not the best for night sky viewing we did get a chance to see the full moon light up the hillside. Still not great as the moon played peek-a-boo with a cloud bank just to the south of us. Anne who was at the Agawa Bay Campground, which is not really too far away from our site, confirmed this and said she had no stars this night. No rain all night, and actual partly cloudy in the morning with our first, sort of sunrise. We did manage to get all packed up before the rain started. It is not that far to the Hwy. 17 take out and with the higher water it would be a nice effortless float. For those that read “The Forest” you will come across “Burned Rock Pool” this is the same place as “Burnt Rock Pool” on the Towab trail in the park and the view is timeless. The conditions did not lend for even a reasonable photo this day so here is a view from the canoe at Burnt rock pool from last years trip. With as dark as the conditions were we did get to see some eagles at one point there were at least 6 close together. In the distance now we could hear the sounds of civilization as a tree crew was working along the hydro lines on HWY 17 near the bridge. It only took about one hour to float down from our campsite to the take-out with a very strong, cold wind coming off the lake. I had said to Anne we should arrive between 10:30 and 11:00 am and we had everything up to the parking area by 10:20 and Anne arrived right at 10:30 which made for a very happy and again wet group. The trip was very successful and we met most of the goals and for the most part unscathed from any physical injuries in conditions that were not the best, but it was the best conditons for 2018 on the 100th anniversary week of the G7 box car trips. We really could not ask for more. A big thanks to Sue and Jim for trusting me enough to take them down this river and sharing with me their G7 passion. A ton thanks to Sandi for coming in at the last moment to make this happen. Joining a group of people you do not know on a very tough wilderness river in the shoulder season takes a lot of courage. Also a big thanks to my wife Anne who shuttled us in on very sketchy logging roads and had her own “adventure” With out her help my adventures in the canyon would have ended when the passenger train stopped. And also to all the “former” old timers of the area, whose passion for the Canyon has inspired me to keep coming back. The mysticism is everywhere here, from sunsets on Agawa Bay to the mists that flow over the canyon walls, you just have to slow down and feel it!